At a time when many of the large or publicly-held companies globally are focused relentlessly on how to grow, today we talk about one growth strategy that, at first glance, might not seem closely related: How to sell. It’s no secret that many companies see divestments as a fundamental part of their capital strategy, especially to fund growth. What you may not know is: We now should expect that trend to grow. How do we know? Ernst & Young recently released a new and important review: It’s 2015 EY Global Corporate Divestment Study. They spoke with more than 800 corporate executives across sectors and around the world. And the headline is clear: More than half of the companies surveyed expect the number of strategic sellers to increase in the next 12 months. Why is divestment such an important strategy? Which sectors will use it most and why? Most importantly, what defines success? 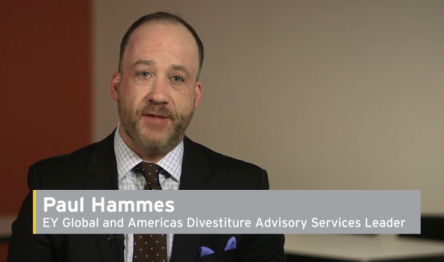 Paul Hammes is the Ernst and Young Global Divestiture Advisory Services Leader and co-author of the study. He works on carve-outs, tax-free spinoffs, roll-ups, IPOs and more across a range of industries.